With this item you will earn 181.17 Points in Homespun Rewards! We love this sweet panel quilt by Pink Chandelier for Wilmington Prints! 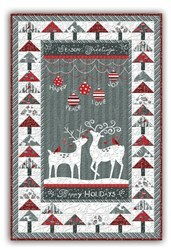 The Wall hanging Measures 39" x 59", and the kit includes all of the fabric to complete the quilt kit, including binding and easy-to-follow instructiosn. 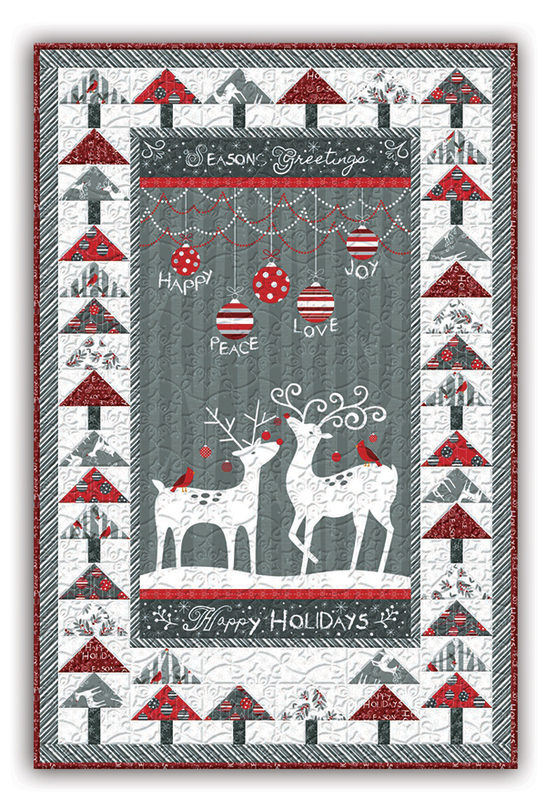 The panel is so sweet, with ornaments that are all about 'Happy', 'Peace', 'Love', and 'Joy', the sweet reindeer with their cardinal friends on their backs, and the 'Happy Holidays" on the bottom. A sweet tree border caps off the panel. Backing Sold Separate - 2 3/4 yards. Prefer this in a larger size? We also have this available in a Throw size quilt Here.